Laleh June have great pleasure to present a solo exhibition by the Swiss painter Crystel Ceresa (born in Geneva 1977, lives and works in Geneva ). In her first solo exhibition at Laleh June Galerie, Crystel Ceresa presents a project based around the twin themes of automatic writing and random poetry, a project which takes the form of a series of painted tondi, an installation on the ground, and a large painted mural. Crystel Ceresa paints large-scale works in a style resembling aerography, spraying the paint at the canvas more than painting with it, instilling her work with lightness in the literal sense of the term, as much with regard to its content as its form. 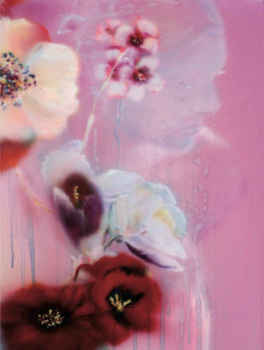 Her subjects are all bright and flowery in appearance; however, upon closer inspection, it becomes clear that the artist understands her painting as part of a more profound discourse, which feeds on the recurrent themes of art history: the vanities of the baroque, the kitsch, bourgeois eroticism of the 19th century, and the symbolism, the sublimated thinking of the Pre-Raphaelites. More precisely, Crystel Ceresa’s painting is a reflection on how to represent the presence and absence of the human form, its appearance and disappearance, and the fragile moment of its existence in a universe of shadow, buried in a corner of memory. It’s also an attempt to present a work on the ebb and flow of human encounters, the fleeting and the furtive, the interpreted anecdote, like those stories which are heard and then retold with an additional element of interpretation and enigma, of memories deconstructed and reconstituted with hyperlinks. The viewer is thus confronted with spreading waves, with minor daily deaths, with small lives, with illusory fragments, and with magic, frozen between two uncertain moments. Taking the form of a wallpainting, similar in some ways to graffiti or to a tree into which words and phrases have been carved, Crystel Ceresa affixes the words one after the other, whispers phrases which overlap, collide and merge like memories which have become hazy, more or less cleansed of their human content. All that remains are orphaned words, reconciled phrases, short Dada poems, automatic writing, fragments of text and streams of words suspended like miniature clouds or raindrops, now bitter, now sweet, which glide over our ghosts and whence, now and again, a poisoned drop slips into the hollows of our hopes and desires. The technique of aerography itself, with its powdery nature, delicate and yet at the same time blurry, lends itself especially well to representing these suspended moments, these threads of memories, these zones of shadow, these impromptu poems. The paint is projected and the very absence of physical touch renders it all the more unearthly, lending it an almost ghostly dimension. The works themselves are presented in a very large format; their scale is all the better for revealing and concealing, and for taking advantage of tricks of perspective. The opening will be on February 5, 2009 from 5 to 9 p.m. You are cordially invited to meet with the artist. We are pleased to provide you with visual material on request ( [email protected] ). We are looking forward to welcoming you and thank you for your interest.